The AMS braking test is an internationally recognised test to determine braking distance, developed by the magazine “Auto Motor und Sport” (a leading German car magazine). Even the German car club (the ADAC), and the TÜV (German testing authorities) refer to it. THE TEST: DO THE PADS PERFORM WHEN HOT AND COLD? The car is loaded with two people and sacks filled with granulated steel to bring it up to the permissible gross vehicle weight. The car is then brought to a standstill by braking from a speed of 100 km/h ten times in a row. This means an intense cycle of accelerating and braking, in which the brake discs can heat up to temperatures of up to 700 °C. In these conditions, it is also possible to simulate the dreaded fading feeling when driving downhill with a fully laden vehicle on a flat surface. Fading is a term used to describe the reduced impact of braking, which occurs when the vehicle is heavily loaded. The resulting high temperatures in this test release binding agents from the brake pad which forms a lubricating film between the brake pad and the disc, reducing the friction coefficient and the braking performance. In an AMS Test, only the first and tenth braking applications are evaluated to provide information about the characteristics of the brake pads when they are cold and when they are hot. The question is: Do the brake pads perform as reliably at high temperatures as they do when cold? Textar brake pads and the competitor products performed better than the OEM materials when the brakes were cold. Even when the brakes were hot, all but one of the brake pads were able to undercut the OEM pad in terms of braking distance. Textar is the safest provider in this field: The difference between the first and tenth braking application was only 0.2 m. This is the same exact measurement achieved by the OEM material. The biggest difference between distances by a competitor was 8.7 m – that is approximately two car lengths: a distance that could mean the difference between life and death. 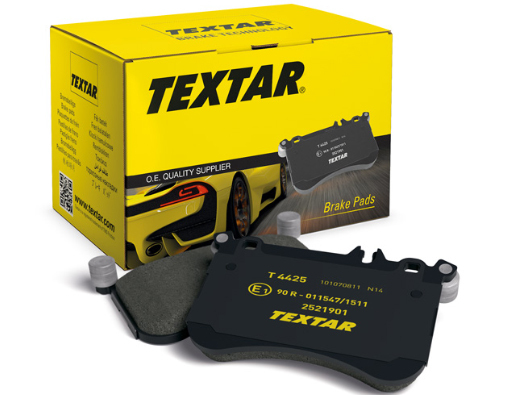 Textar performed better than all of its competitors during hot and cold braking and even achieved better results than the OEM brake pad on the VW Passat Variant. This result illustrates just how highly Textar rates the issue of safety. It also shows that brake pads from the aftermarket can be even better than the products originally fi tted by the vehicle manufacturer. Provided that a quality product, such as Textar, is chosen.